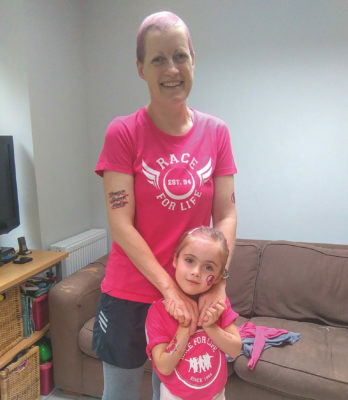 Being diagnosed with breast cancer at the age of 42 felt like the bottom had fallen out of my world,” says Sarah Logan, 45, a primary school teacher and mum of two, from Sydenham in south-east London. “It was a total shock. In fact, it almost felt as if it was happening to someone else. Within the first week of being diagnosed, I was having terrible uncontrollable shakes at night and was unable to concentrate on anything. My friends and family were also shocked, but rallied round and did their best to help me in any way they could. My mum travelled down from Scotland immediately and was there for me as much as she could be during treatment, and my sister and her family came over from Canada to spend three weeks with me. “The most difficult thing about having cancer was feeling I’d lost all control over my life. And the fear of dying: my consultant told me that the type of cancer I had was ‘aggressive’ and that they would treat it ‘aggressively’, which was terrifying. I was told I had triple negative breast cancer, which doesn’t respond to hormonal therapy (such as tamoxifen) or other therapies, such as Herceptin. “It was really scary attending the first chemotherapy session: there was the fear of the unknown, and I was also worried about how I’d react to my hair falling out. I needed to have a total of 16 sessions, so at the beginning it seemed like it would go on forever. My lowest point mentally was after the third session, when I felt sick, exhausted and dizzy. At the same time, the nurses were giving me dates for upcoming sessions, which included Christmas Eve and New Year’s Eve, which made me cry for a whole day. However, I got through it and, despite several delays due to a very low white-cell count, one hospitalisation due to infection, and 54 horrible white-blood-cell-stimulating injections, I made it to the end. 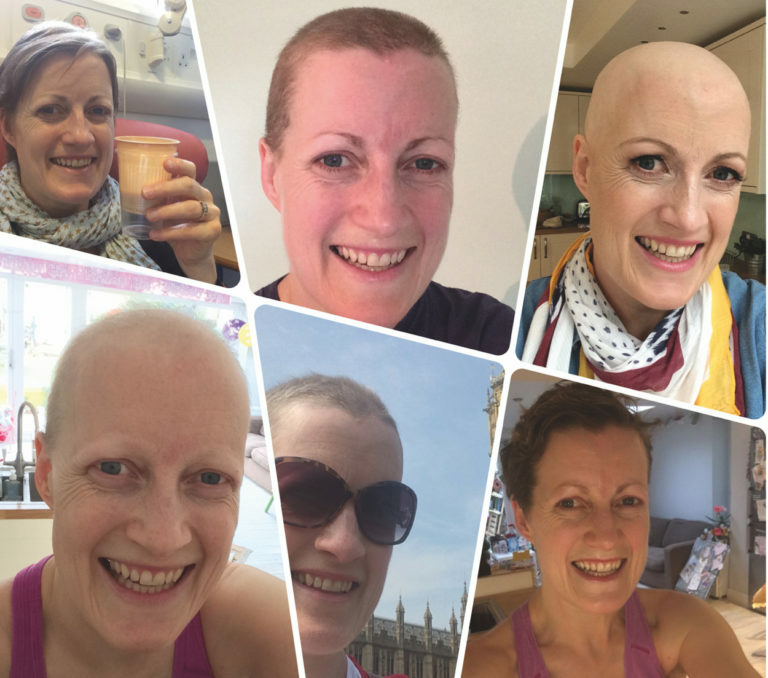 “My hair started to fall out in clumps 18 days after my first chemo session and, three weeks later, I shaved off what was left. I lost all my eyebrows and eyelashes, too. It was really horrible: seeing my last eyelash dangling and then finally falling off was utterly depressing. I barely recognised myself. However, I’d heard about other women who’d attended a Look Good Feel Better (LGFB) session that made them feel much better about themselves, so I thought I’d give it a go. “It was lovely being in a room full of other women who’d had a similar experience, knowing that everyone else understood. I wasn’t much of a make-up wearer pre-cancer (apart from going out), but the LGFB volunteers were amazing and took their time to talk through and demonstrate the different products. I’d never used eyebrow pencil before, but was a lot more confident about applying it afterwards. We were also given some fantastic products: I think about the course every time I put on blusher! “I’ve always been a keen runner – it was thanks to my breasts shrinking due to losing weight through running that I found my lump in the first place. Soon after being diagnosed, I was looking for positive cancer stories and came across an American TV presenter called Jennifer Griffin, who also had triple negative breast cancer and was the mum of small children. She’d eaten super healthily and exercised throughout chemo, running on the morning of each session. Inspired by her positive attitude I did the same, which got the endorphins going and made me feel more positive. It got harder and harder towards the end and I fell over with about three chemo sessions to go (I tripped on the pavement as I was pretty knackered and weak). So I carried on with fitness DVDs indoors instead. 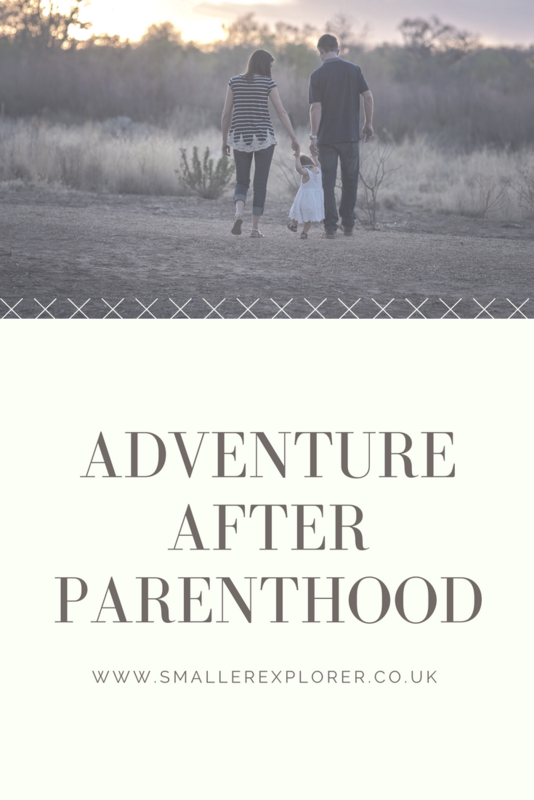 “Three weeks after the chemo ended, I had a lumpectomy. When I woke up after the surgery I felt absolutely awful and had a tummy bug for about a week afterwards, but I slowly recovered. Soon after, I was told I’d had a total response to the chemo, for which I was very relieved and happy. Two months after that I had 23 radiotherapy treatments. “During this time I joined Team Phoenix, a group for breast-cancer survivors, who want to ‘rise from the ashes’ by crossing the finishing line of a triathlon together. I’d never swum front crawl before, so it was great to focus on a new skill. I met some wonderful women who’d been through the same experience as me. After we’d committed to doing the Hever Triathlon we spent the summer training, sometimes by ourselves, but often as a group. “That July, nearly 12 months after I’d been diagnosed, I ran my first parkrun, three days before I finished radiotherapy. I was really focused and determined to do my best and I just went for it! I was really happy when my results showed I’d finished in 26mins 29secs. 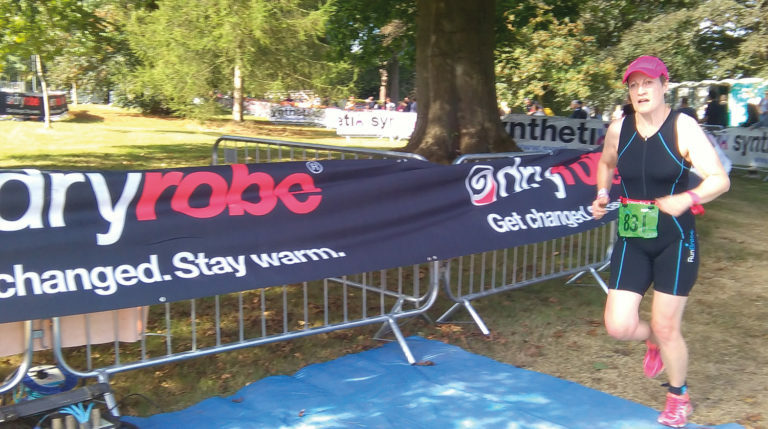 “Two-and-a-half months later I completed the Hever Triathlon and had one of the best days of my life: I can honestly say I smiled the whole way round. I was super nervous, particularly about the swimming (we swam in wetsuits in a lake, so I was totally out of my comfort zone!). But I absolutely loved it. Ironically, on the same day one of my really good friends who’d been diagnosed with the same type of cancer in the same week as me received some devastating news. Her cancer had spread to her lungs as her chemo hadn’t worked. She was being sent home for palliative care as she was going to die. So it was a bittersweet day, but also a reminder of how lucky I was to be able to take part in such an incredible event. “After doing the Hever Tri again the following year, I decided I wanted some running challenges again, so I signed up for the Bath Half Marathon. I started training for it at the beginning of November 2017 and now run four to five times a week. 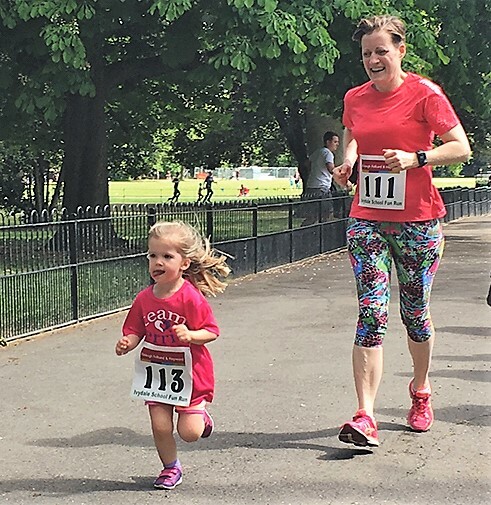 I have to be very organised and timetable in my runs around all my other work and family commitments: I run while my older daughter is at Brownies, and early on Sunday mornings, while both daughters attend Irish dancing. And if you want to know more about the fantastic Sarah, this is what else she’s been up to recently…. “We always have something planned. Life’s too short and the world is too big not to! We went to Italy in the summer and rather than flying we went by train it all the way with our little backpacks! My sister and I used to go on trains to the south of France when we were little so we thought it would be fun to take the train. Also, we both love planning holidays with a bit of variety so it was fun to fit a couple of days in Paris in before Italy. 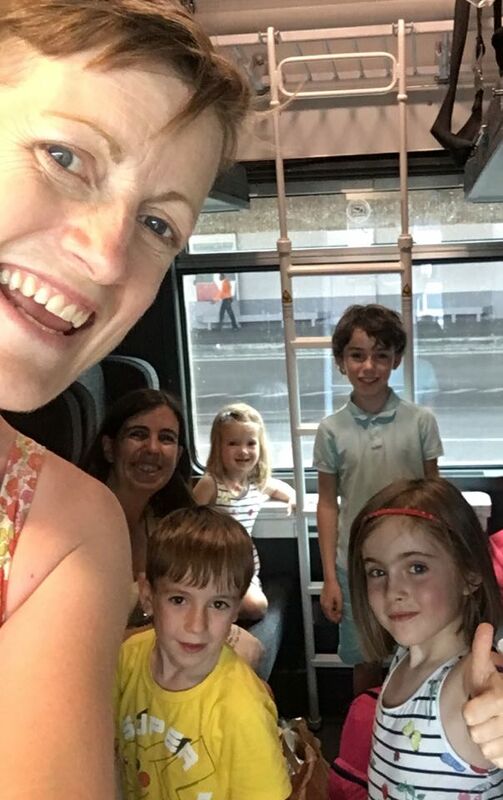 We booked the train on the day the seats/bunks went on sale as the summer trains sell out very quickly. We booked everything ourselves on the internet. I also took the girls to Vancouver island at Easter to visit my sister and their cousins.